PMC casts an i over its IB2, MB2 and BB5 speakers | What Hi-Fi? The new designs now carry an i suffix, and the most obvious change is the adoption of the PMC/SEAS Sonolex 27mm tweeter, complete with dispersion plate. This is designed to give significant improvements in imaging and top-end clarity, while also creating a larger soundstage with better focus. Larger speakers have the striking Radial driver: a 31cm in the MB2i, and a 38cm in the BB5i. All the speakers use a newly-upgraded 32-element crossover. The BB5, by the way, is designed for use with amps from 200W to 1kW! As well as having PMC's familiar Advanced Transmission Line loading, the new cabinets are now made from higher-density Medite, with a staggered jointing process being used to give greater integrity and stability. 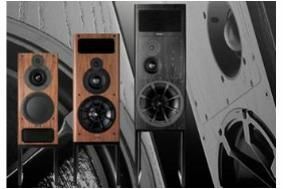 The speakers are available in black ash, walnut, oak or cherry wood veneers, and are priced at £8900 a pair for the IB2i, £10,350/pr for the MB2i and £14,950/pr for the BB5i.